A part of my current book project looks at enslaved refugees during the Civil War who wore pierced half dimes on strings around their ankles as charms to protect them (and especially their children) in perilous freedom journeys. In the Union camps where they arrived, they earned wages and received coins for various things and so presumably had more coins in circulation. 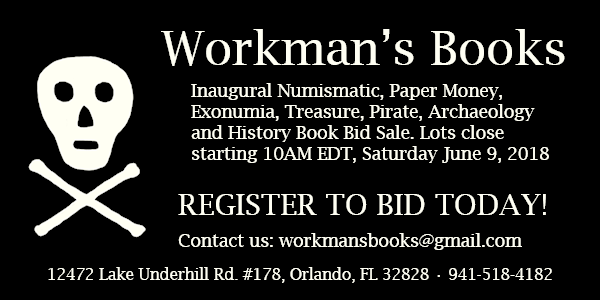 There was no bank, so sometimes they gave their money to missionaries to hold or to buy something for them, or they bought items themselves from sutlers' tents (where the price gouging was especially terrible for African Americans). Or they might have chosen to continue to pierce the half dimes and wear them rather than spend them (the evidence for the pierced half dimes comes from archaeological digs and interviews). My research question has both a practical and an interpretive dimension. I want to know if the pierced half dime as a charm had power that merged with the power of the nation-state or if the pierced half dime as a charm derived its power as a reappropriation of an object toward a completely different understanding of value. I don't know that it will be a completely either/or answer, but interrogating the subject in this way will yield insights nonetheless, I believe. • In the mid-19th century/Civil War years, did piercing a dime compromise or nullify its value as legal tender? • In 1866 the half-dime denomination began to be minted as part copper and part nickel instead of silver. The timing coinciding with the end of the Civil War certainly has significance. • If you had a half dime made of silver, would the silver itself be worth more or less than 5 cents? More generally, I am curious if anyone could speak to laypeople's understanding of coins as investments tied to nation and/or coins as lucky charms in the 19th century or Civil War period. I'm grateful for any responses this inquiry might garner. I'm sure our readers will have something to add, but I'll offer this. First, all coins of intrinsic value (silver, gold) disappeared from circulation early in the war and took decades to fully restore. The reason specie disappeared was that its value greatly increased in relation to paper money (which became worth less and less). So yes, half dimes in silver became worth more than five cents. The government response was to replace the silver half dime with the new nickel five-cent piece. It had an intrinsic value below the face value, so no one had a reason to hoard and not spend them. As for the value of a holed piece, its intrinsic value is lower because of any silver lost in making the hole. But the value of the remaining silver was probably still above the five cent face value, keeping them worth holding on to. Interviews with former slaves conducted in the 1930s make up the bulk of my research. I included an image from an archaeological dig of one of the camps I study (Camp Nelson). The camp was burned down in 1864, so you can see that the coin is singed. I also included an image of a non-singed pierced coin from eBay. It's a fairly common Seated Liberty half-dime. I pasted excerpts from my manuscript below. “Every one of my children wears a silver dime on a string around their leg to keep off the witches spell,” said Gertrude Vogler of Kentucky. Gertrude Vogler interview, AS: KS,KY,MD,OH,VA,TN Narratives Vol. 16 (1972) [WPA 4847]. Other interviews with former slaves discuss this practice. See the following:Willis Williams described different charms in his 1937 interview: “Others wore a silver coin in their shoes and some made holes in the coin, threaded a string through it, attached it to the ankle so that no one could conjure them.” Willis Williams interview, March 20, 1937, Jacksonville, Florida, interviewed by Viola Muse, AS: Florida Narratives Vol. 17 (1972), [WPA 3556]. See also: incidence of wearing coin around leg that turns black when conjured in Interview with George Womble AS:Georgia Narratives Part 2 Supp Ser 1 Vol 4 [WPA 4067] (it turns green in Moslie Thompson’s account AS:Texas Narratives: Part 8, Supp. Ser. 2, Vol 9 [WPA 8731]), explanation of wearing asafetida and metal coin around neck to help prevent illness in Interview with Cornelia Robinson AS: Alabama Narratives Supp Ser 1 Vol 1 [WPA 620], silver coin turns black in the mouth when conjured in AS:Georgia Narratives Vol 13 , description of root man’s rules regarding coins, Drums and Shadows, 33 [WPA 12968]. At the time of her 1930s interview Alice Green had a coin tied to a string soaked in kerosene just above her knee, AS: Georgia Narratives Vol 12 [WPA 4292]. See more mentions and explanations in: William Adams in AS:Texas Narratives Parts 1 and 2 Vol 4 [WPA 9219]. Tildy Collins in AS:Vol. 6 IN, AL [WPA 11196], Drums and Shadows, 86 [WPA 12995], 126 [WPA 13015]. Stephen McCray, The American Slave_Oklahoma and Mississippi Narratives Vol 7; Mom Ellen Godfrey, October 1937, Conway, S. C. Interviewed by Mrs. Lucile Young and H. Grady Davis, The American Slave--North Carolina & South Carolina Narratives: Supp. Ser. 1, Vol 11. Left: Silver coin with small hole for attaching to ankle as a charm, recovered from site of contraband camp at Camp Nelson, Kentucky. 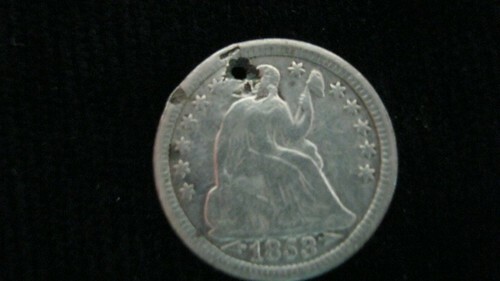 Coin has burn damage from November 1864 army expulsion of refugees. 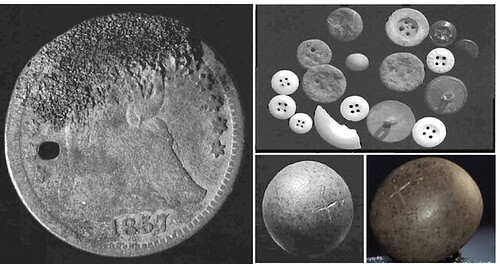 Right top: A variety of buttons from the encampment site. Right bottom: Button with cosmogram etched in it, a West African Kongo symbol of the universe. W. Stephen McBride and Kim A. McBride, Seizing Freedom: Archaeology of Escaped Slaves at Camp Nelson, Kentucky, Kentucky Archaeological Survey.